Wizards have the followring starting primary skills: 0/1/2/2. But, the way I see things, that does no justice to this class' archetype — wizards have always been depicted, in all media, as maestri of magic. Therefore, they are no hybrid class or quasi-magi, they should prioritize magic (over might) more than all of the other classes. That is, they're supposed to be the polar opposite of barbarians — the epitome of arcane lore (remember Heroes Chronicles: Masters of the Elements; "Tarnum becomes that which he hates most, a Wizard"). Think about it for a second, can one really imagine that a staff wielding, ponty hat, old wise man could have any interest (or ability) in physical combat? Therefore, these starting skills really do not reflect the spirit of the class. In fact, I think they should start off as 0/0/3/3 (as elementalists do, in Heroes III) and, maybe, have some disadvantage reflected in their troops. Thank you for reading, I hope my ideas can reach your heart. I think I get your point. Still it would be in my opinion bad to change starting skill values to 0/0/3/3 (with book as wizard simply has to have one). It would be very complicated to balance "some troop disadvantage". I would be entirely in favor of this change! However, I think the Wizards' scaling should reamain the same (therefore changing only the starting primary skills). That said, I have no words to express my gratitude for your quick and precise response. I wish all discussions were fruitful and respectful like this. In fact, the Wizard in Heroes 2 was implemented as a hybrid class for a selection of reasons. In Heroes 1, the progenitor of the series, there were only 2 magic classes: Sorceress, who is focused on Knowledge (a more defensive skill), and Warlock, who is focused on Spell Power, being more offensive. This was also reflected in their troops, with Warlock having a lot of fliers and fast creatures convenient for aggressive skirmish gameplay. The Wizard and Necromancer were the hybrid classes implemented in Heroes 2, with the first one having a more defensive character, and the second one being more offensive. This is also somehow reflected in the faction lineups, where the Wizard has a lot of shooters, and the Necromancer is focused on losses and recoveries thanks to the Necromancy skill. With the implementation of Secondary Skills, the factions have received more distinction. 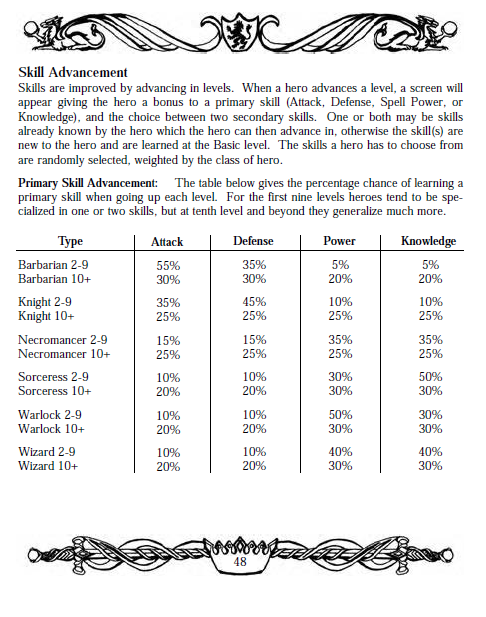 In Heroes 1, Knight had a morale bonus, Barbarian did not have the rough terrain penalty, Sorceress was more mobile on water, and Warlock had a bonus to the viewable range. 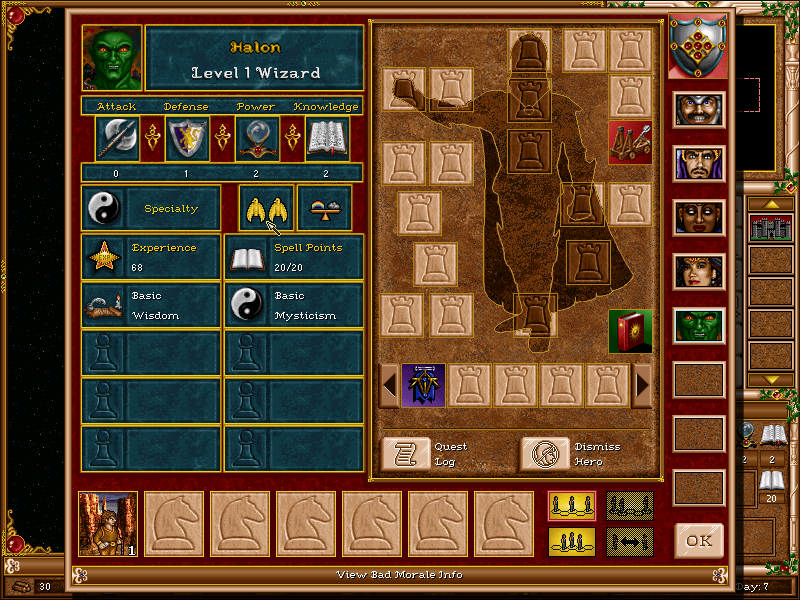 In Heroes 2, these bonuses were transferred in the form of Secondary Skills, with Leadership, Pathfinding, Navigation, and Scouting, respectively. Knight also got Ballistics to emphasize on his medieval concept, and spellcasters got the basic Wisdom skill to become more different from the warrior classes and thus their spellcasting ability was underlined. With the appearance of two new factions, something had to be done to distinct them from already existing ones. The Necromancer had a profile skill not available to any others, except Warlock in rare cases: the Necromancy. Again, to underline his spellcasting nature, Basic Wisdom was given. But what do we know about the Wizard, then? In fact, Advanced Wisdom was given to the Wizard class. This did the trick, and Wizard in fact was perceived as the "magician over magicians", being the most convenient class when it came to learning high-level spells. Honestly, you are the first person I meet with an opinion like "Wizards are not magical enough". And let me explain why Wizards are going to stay like they are, in terms of starting skills at least. Even if you do not care about the tradition of the first two games (which matters a lot to us), there is another major argument rendering your suggestion invalid for Heroes 2, and the project as well. This is the fact that having enhanced magic skills, Wizards will be extremely powerful at start, being able to cast any high level spell they wish, given the fact that in Heroes 2 they needed only 1 level-up to reach Expert Wisdom. What you suggest is them having 30 Mana and 3 Spell Power at start, being able to cast the most destructive and/or sophisticated spells for any faction which successfully generates them in a Tavern and has a built-in Mage Guild, which can be built up to level 5 in both H2 and H3SW. Having Wizard troops nerfed does not do the trick, and this is obvious because of the abovementioned reason. Spamming Armageddon at Spell Power 3-4 when the enemy is near? Sure, why not. Even with our new class system this is impossible to consider. This is what I meant when I advised you to look on situations from different angles in a Facebook dialogue. The game is more complex than just a tiny suggestion, and sometimes a tiny suggestion ruins the whole concept, or even renders the game unplayable. I agrees 100% with Orzie. I don't see why you would make the change you propose and I believe Wizard is certainly (both in H2 and H3SW) the most "magic focused" of the hero classes. Also the focus on the Wisdom secondary skill goes well with the special building of the Wizard - The Library - which provides another spell to each level of the mage guild. Thanks for full-explanatory answer, Orzie! I haven't seen the context between H1 and H2, and even realized the advanced wisdom thing. It all makes perfect sense! Well, Heroes 2 was never about the balance, so that we had useless Hypnotize spell on level 5 or Peasants which were blindly transfered from Heroes 1. Still, yes, NWC did have some opinion on the Wizard, so they emphasized on the magic of this class from the point of wisdom and the ability to learn spells, and not spell power. There could be a whole philosophical debate about this, what's better or what's more characteristic for a magician - intellect, willpower, physical/mental capabilities or experience/wisdom earned with ages, but I need to draw the parts of the Statue of Legion further. I should add that we also used a similar principle in our new factions. The Witch is made contrary to Sorceress in some sense: while Sorceresses are about knowledge and mana points, the Witches are focused more on regenerating mana and using fast magic, being closer to Warlocks in this sense. The Dervish has now got a Luck profile skill, as a counterpart of Knight's Leadership. Lore-wise, the Dervish is a cunning trader with lots of mysteries in his sack. (Estates was proven to be drastically overpowered). Cool Head of the legion looks nice Looking forward for the other parts! It never really bothered me who is the "most magical" hero. When thinking about Homm and MM games and NWC not following a strict bible, I guess the H2 wizard got its primary and secondary skills as Orzie said. In H2 wisdom was a powerful secondary skill. The opening post mentions elementalists. They started 0033 and were considered very powerful, but not so much because of primary skills, but access to elemental secondary skills. In H3 wisdom is not as important any more, because the true magic mastery comes from elemental magic skills. In H5 wizards started 0023 and the guild was cheap compared to H2/3. Again the divison of masteries into magic schools limited wizard power. I do not know how wisdom and magic school relationships are in H3SW, but it certainly will matter for determining how distinct magic heroes feel, which of them are more useful and which is the "highest magican". EDIT. PS I am just developing the topic a bit further, with no aim to change anything that the team does not wish to change. That's why I dislike answering in the chats, because I just provided the necessary information to the topicstarter via Facebook, but everyone else did not get this information. I'll try to transfer the messages here. Q: Hi, and thank you again for your careful response. "I agrees 100% with Orzie. I don't see why you would make the change you propose and I believe Wizard is certainly (both in H2 and H3SW) the most "magic focused" of the hero classes." How is the wizard going to be the most "magic focused", if he starts with one less point in the magic primary skills? Is he going to have better chances to improve knowledge/spell power when he levels up than the other classes? Besides the library, is he going to have any sort of magical edge over the other classes? A: In H3SW, there is a concept of faction skills. Unlike Heroes 2, though, where the factions had fixed 2 special skills, our factions have only 1 skill, with the other one being dependent on the hero's specialty or other factors. The only faction utilizing the Wisdom skill as a special faction skill is Wizard. This, and the increased amount of spells available to the Wizard, are primary features which outline the Wizard as a special spellcaster class. Primary skills are not the only features of the game which may define the magic-oriented class. Q: But, may I ask, how is the wizard going to use wisdom as a special skill? A: Just as any other faction would, we did not change Wisdom effects. But, no one can learn Expert Elemental Magic without getting Expert Wisdom first, so the Wizard is one step further in that. Q: So, in your POV, is the Wizard, in Heroes IIISW, the mage of the magi? A: For sure he is, and that's how the Wizard has always been in Heroes 2. All factions have their own gameplay style, but we can speak about some kind of balance only when the magic system is re-done. This is not happening in the following v0.8 release, so the magic is currently based on H3 system in 99% of aspects. For v0.9 release, the completely re-done magic system can be expected. Q: Are you keeping the post level 10 scaling of heroes? A: Yes, mostly, but this can be more or less varied in future. Anyhow, what's more important is the percentages of certain Secondary Skills which are available to each class. Q: Understood. I asked this, because, since sorceress have more spell points, warlocks have more spell power, how is the Wizard goin to be more "magical" than those two (and the witches, for that matter)? Besides havegin the opportunity to learn more spells (library)? A: Wizard is going to be more balanced that the abovementioned classes, plus have an advanced ability to learn spells. It should be obvious that Wizard should not lean towards offensive or defensive magic, being equally developed in both. A: If the balance will require any numbers, in the end we will have to assign them, if all else fails. The overall game is more important than personal feelings of some users. For the great justice, I rearranged the Dervish's skills to test in future. Well, the Warlocks got Magic Well working for them... In the long run that seems way more powerful magic-wise than the Library (not to mention there's a warlock specialist in intelligence). Also, Wisdom as a starting secondary skill does not seem to give any advantage in the long run.